For others with similar names, see Joseph Carter (disambiguation). Joseph Chris Carter (born March 7, 1960) is an American former professional baseball player. He played in Major League Baseball (MLB) as an outfielder and first baseman for the Chicago Cubs, Cleveland Indians, San Diego Padres, Toronto Blue Jays, Baltimore Orioles, and San Francisco Giants. Carter is best known for hitting a walk-off home run to win the 1993 World Series for the Toronto Blue Jays. 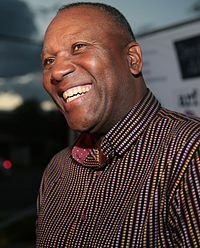 Joe Carter attended Wichita State University, leaving after his junior year. He was named The Sporting News magazine's College Player of the Year in 1981. In the 1981 MLB draft, the Chicago Cubs chose him with the second overall pick. Carter first reached the majors in 1983 with the Cubs, but was traded to the Cleveland Indians the following year, where he blossomed into a star. Carter emerged as a prolific power hitter, hitting as many as 35 home runs in a season and regularly driving in 100 or more runs. He usually hit nearly as many doubles as he did homers, and would get respectable numbers of triples in many years too. He was also a very good baserunner, stealing 20-30 bases a year with a high rate of success; in 1987, Carter became a rare member of the single-season 30–30 club for home runs/stolen bases. After a strong 1989 season, Carter was traded by Cleveland to the San Diego Padres for prospects Sandy Alomar, Jr., Carlos Baerga, and Chris James. Although he continued to drive in runs, he also continued to have defensive problems. The Padres subsequently dealt him to the Toronto Blue Jays along with Roberto Alomar in exchange for star players Fred McGriff and Tony Fernández. Joe Carter is a member of the Toronto Blue Jays' Level of Excellence. Carter's overall game improved dramatically in 1991, as he helped the Toronto Blue Jays win the division title and hit the game-winning single that clinched the AL East championship; he also emerged for the first time as a team leader. In 1992, he helped the Jays win their first World Series championship, the first ever won by a Canadian-based team. Carter hit two home runs and recorded the final out of the Series, taking a throw to first base from reliever Mike Timlin to nab Otis Nixon of the Atlanta Braves, who bunted. This was the first time a World Series ended on a bunt. Carter and Edwin Encarnación are the only two Blue Jays to hit two home runs in one inning, with Carter's coming against the Baltimore Orioles in 1993 and Encarnacion's against the Houston Astros in 2013. In 1993, the Blue Jays reached the World Series again, facing the Philadelphia Phillies. In Game 6, with the Blue Jays leading three games to two, Carter came to bat with one out in the bottom of the ninth inning with the Blue Jays trailing 6–5 and Rickey Henderson and Paul Molitor on base. On a 2–2 count, Carter hit a three-run walk-off home run off Phillies pitcher Mitch Williams (against whom he had previously been 0–4 in his career) to win the World Series, only the second time a Series has ended with a home run (the other being in 1960, when Bill Mazeroski did it for the Pittsburgh Pirates against the New York Yankees), and the only time the home run has been hit by a player whose team was trailing in the bottom of the 9th inning in a potential championship clinching game. Upon hitting the home run, Carter jumped up and down many times, most notably while rounding first base, where his helmet came off. Tom Cheek, the Blue Jays' radio broadcaster, called the play: "Touch 'em all, Joe! You'll never hit a bigger home run in your life!" Carter continued to play for the Blue Jays until 1997, and led the Blue Jays in home runs and RBIs in 1994 and 1995. When he represented the Blue Jays at the 1996 All-Star Game, he received boos for his home run that won the Blue Jays the 1993 World Series, as the game took place at Veterans Stadium, then the home of the Philadelphia Phillies. During the 1997 season, he snuck an unlicensed maple wood baseball bat manufactured by Sam Bat into a game. He became a free agent in 1998 and briefly played for the Baltimore Orioles and San Francisco Giants before retiring. Carter ended his career by popping out to end the game in a one-game playoff against the Chicago Cubs. Carter was also involved in the final plays of four games in which the Blue Jays clinched a championship: 1) The game-winning single to drive home Roberto Alomar and clinch the 1991 American League East division championship, 2) catching the final out at first base in the 1992 World Series, 3) catching the final out on a fly ball to right field in the 1993 American League Championship Series, and 4) the walk-off home run in Game 6 of the 1993 World Series. From 1999 to 2000, Carter served as a color commentator for the Toronto Blue Jays on CTV Sportsnet, leaving to work for the Chicago Cubs. From 2001 to 2002, Carter served as the color commentator, alongside play-by-play man Chip Caray, for the Chicago Cubs on WGN-TV. Carter was replaced by the man whom Carter himself replaced, Steve Stone. 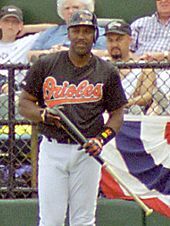 Carter became eligible for the Baseball Hall of Fame in 2003, however, he only received 19 votes, representing 3.8% of the vote and was dropped from future ballots. Carter was inducted into the Canadian Baseball Hall of Fame in 2003. In September 2006, Carter was awarded the Major League Baseball Hometown Heroes Award, as the former or current player who best represents the legacy of his franchise's history, as voted by fans. In 2008, Carter appeared on an episode of Pros vs. Joes. On August 7, 2009, Carter, along with many of his 1992 and 1993 Toronto Blue Jay World Series alumni teammates, attended a reunion/pre-game ceremony at the SkyDome. The event was organized by Carter himself and included three dozen players, coaches and athletic trainers from the Blue Jays' 1992 and 1993 World Series rosters. On May 19, 2012, the Cleveland Indians honored Carter with a bobblehead giveaway bearing his likeness during their game against the Miami Marlins. Carter attended and signed autographs, as well as throwing out the ceremonial first pitch. On July 14, 2015, in a pregame ceremony before the 2015 All-Star Game, it was announced that Carter was elected by fans as a Franchise Four member of the Toronto Blue Jays, as one of the four most valuable players in franchise history. Carter co-chairs the annual "Joe Carter Classic", a celebrity golf tournament in the Toronto area founded in 2010 to benefit the Children's Aid Foundation. The tournament has raised over $225,000 for the foundation. Previous events have featured celebrities including Charles Barkley, Ray Bourque, and Gordie Howe. 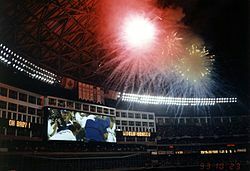 In July 2015, Carter's walk-off home run celebration was used as the track artwork for the song "Back to Back" released by Toronto native Drake. In 1988, Carter was inducted into the Wichita State University Pizza Hut Shocker Hall of Fame. In 1999, Carter was inducted into the Missouri Valley Hall of Fame. In 2003, Carter was inducted into the Canadian Baseball Hall of Fame. In 2004, Carter was inducted into the Ontario Sports Hall of Fame. In 2008, Carter was inducted into the Kansas Baseball Hall of Fame. ^ "Joe Carter Stats". Baseball Almanac. Retrieved October 30, 2012. ^ "CARTER, JOSEPH CHRIS (1960- )". Digital.library.okstate.edu. 1960-03-07. Retrieved 2013-09-28. ^ "Joe Carter (Baseball, 1979-81) – GoShockers.com—Official Web Site of Wichita State Athletics". Admin.xosn.com. Retrieved 2013-09-28. ^ Doyle, Al (January 1987). "Joe Carter: An Emerging Star for Revived Indians". Baseball Digest. Lakeside Publishing. 46 (1): 19. ISSN 0005-609X. Retrieved 2009-05-07. ^ Elliott, Bob (5 December 2012). "Late Blue Jays announcer Tom Cheek named Ford C. Frick Award winner". Toronto Sun. Retrieved 8 August 2016. ^ Carchidi, Sam (July 9, 1996). "Carter Likes Even the Boos at the Vet". Philadelphia Inquirer. p. D6. ^ Bodley, Hal (July 10, 1996). "To Phillie fans, Carter still Public Enemy No. 1". USA Today. p. 3C. Joe Carter...walked out onto the sizzling Veterans Stadium turf...held his head high...and heard the boos even before he was introduced. Hard-core Philly baseball fans...(will) never forgive Carter for the dramatic ninth-inning home run that won the 1993 World Series. ^ Griffin, Richard (July 9, 1996). "This time, Phillies pitcher shuts down Carter". Toronto Star. p. C3. As Carter took his first swing and the on-field introduction was made, the boos rained down. ^ Curry, Jack (28 July 2007). "Why Bonds Will Never Have to Borrow a Bat". The New York Times. Retrieved 12 January 2017. ^ "One-game playoffs have been epics | MLB.com: News". Bluejays.mlb.com. Retrieved 2013-09-28. ^ Charlton, James. "Joe Carter from the Chronology". BaseballLibrary.com. Archived from the original on 2011-06-04. Retrieved 2008-11-03. ^ "Blue Jays' reunion ends on sour note". CBC News. August 8, 2009. ^ Mike Dyce (29 July 2015). "Drake uses Blue Jays' World Series win over Phillies to troll Meek Mill". Retrieved 30 January 2016. ^ "Pizza Hut Shocker Sports Hall of Fame – GoShockers.com—Official Web Site of Wichita State Athletics". Goshockers.com. 2011-01-31. Archived from the original on 2013-12-09. Retrieved 2013-09-28. ^ "Joe Carter". Retrieved 8 April 2016. ^ "Joe Carter". oshof.ca/. Retrieved 25 September 2014. ^ "Carter and Stephenson to be Inducted into Hall of Fame – GoShockers.com—Official Web Site of Wichita State Athletics". Goshockers.com. Retrieved 2013-09-28.